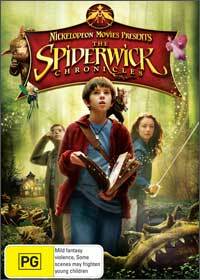 The blockbuster children’s fantasy movie The Spiderwick Chronicles finally arrives on the Blu-Ray and DVD that is based on the popular book series by Holly Black. Directed by Mark Waters (Mean Girls), The Spiderwick Chronicles takes the viewer on a journey beyond the realm of the man, that of the realm of fairies and mythical creatures. When three siblings visit the Spiderwick Estate, they discover that not everything is what it seems and when they discover a dusty old book written by one of their relatives, they are soon drawn into this strange world with a mystery that only they can solve. Featuring a start studded cast that include Freddie Highmore (Charlie and the Chocolate Factory), Mary Louise Parker (Weeds), Sarah Bolger (In American), David Strathairn (Good Night, And Goodluck), Nick Nolte (Troical Thunder) and the voices of Seth Roger (Superbad) and Martin Short (Jiminy Glick in Larawood), director Mark Water does a brilliant job at recreating this popular children’s novel with some stellar performances. The voice of Martin Short is a classic and will have children quite amused. The story is nicely complimented with CGI that at times, these strange goblins and fairies look real. It features a healthy dose of adventure, action and humour that although is targeted for the younger viewing audience, adults can also enjoy the story as they enter the magical world of The Spiderwick Chronicles. Presented in an aspect ratio of 16:9 widescreen with true Dolby Digital 5.1 sound, the video quality is unparalleled and makes a perfect transition to DVD. Featuring a plethora of extras that include some interesting behind the scenes featurettes and how real-world myths assisted in creating the story, this will give the viewer a true understanding of the creation by Holly Black. My only gripe with the DVD version is that the Blu-Ray version contains quite a few more extras. Needless to say, a very entertaining film.